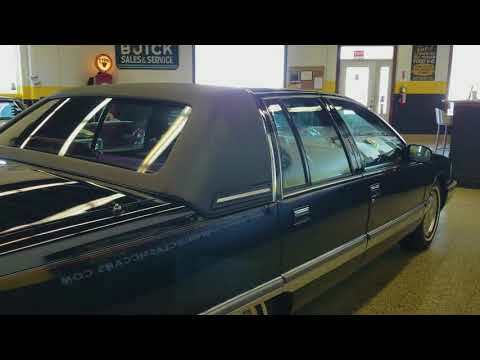 1996 Buick Roadmaster Collectors Edition, 34k ACTUAL MILES! TRADES? Here's one of our favorites that are getting harder and harder to find, especially with the low miles and the condition of this car. Take a look at this stunning 1996 Buick Roadmaster Limited Sedan wearing it's original black paint and dark ruby red sierra grain leather interior. The paint and interior are in extremely nice shape and do not show much signs of wear. Take a look at the pictures and video of the car, the luster and reflections from the paint are outstanding! This car is original and has not been molested in any way. This classic cruiser is powered by the ever popular General Motors LT1 350 V8 with 260 horsepower. The Dyna-RIde suspension and plush seating provide one of the most comfortable riding experience of any Buick ever. This is a 2-owner car that has a clear title and clean Carfax confirming it's accident free and original miles so buy with confidence. We've sold quite a few of these cars in the past and the new owners are never disappointed. This one will be now exception, take a closer look at the pictures and video and we think you'll agree. Give us a call to learn more about this fine Roadmaster Limited at 507-386-1726 or email "sales@uniquemankato.com" TRADES AND OFFERS WILL BE CONSIDERED......FINANCING IS AVAILABLE!